This is a completely customized Air Force theme wedding cake topper ordered by one of our customers. They want the groom to be in the mess dress with a sheepish grin on his face almost like he is thinking, "Oh gosh!". This is because he would like his fiance's figure to be dressed in her gown and saluting him (a bit bent forward, saluting with her right hand). The bride dress is strapless, no sleeves, no gloves, no vale, and is not ruffly. About groom’s uniform, it is the Air Force Mess Dress Uniform. It is equivalent to the civilian tux and worn at social occasions where a tux might be warranted (weddings, formal dinners, etc). The pictures of his uniform show him in Cadet ranks as he is still in training, but the overall design is the same for cadets, enlisted, and officers. The distinction from other Air Force uniforms is that this one bears no hat (or "cover") and the jacket is very open and very short, like a tux. The ranks on his shoulders are silver, and match the "braid" that is on the sleeves of the coat. 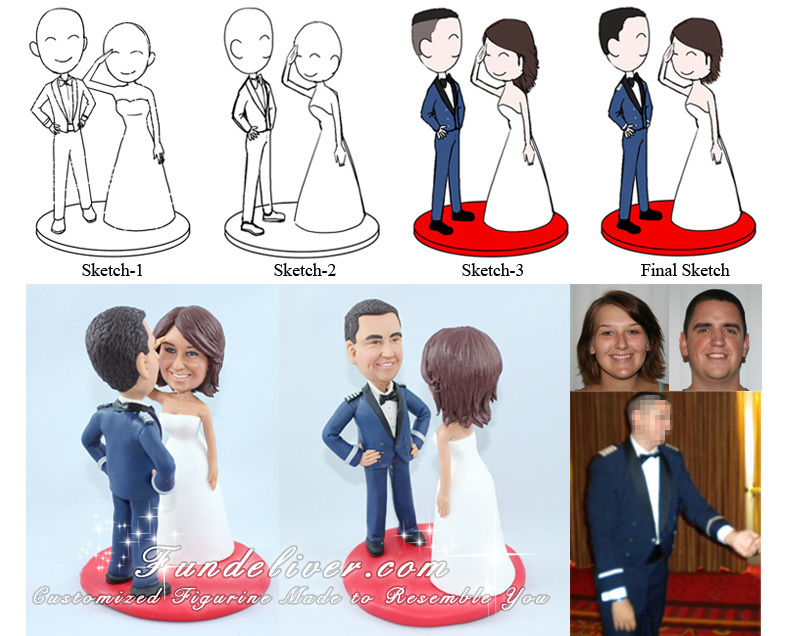 How do you think about this Air Force Wedding Cake Toppers, love it?